We bake our crumpets in our oven, rather than frying them on a griddle in the traditional manner. (Preparing the muffin rings) With your finger, lightly oil the inside of the muffin rings. 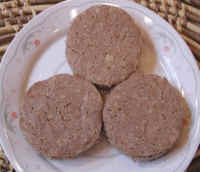 Set the muffin rings on a baking pan that has been dusted with a thin layer of corn meal. (Making the crumpet dough) Begin by washing and peeling the potato and garlic and baking them in a microwave oven until the potato is tender. 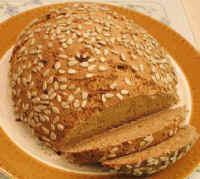 Place the spelt, or other whole grain flour, in a mixing bowl. Place two cups of water in a blender, add the baked potato and garlic, cover and run it at high speed until the potato and garalic are completely blended into the water. Stop the blender and pour the potato mixture into the mixing bowl. 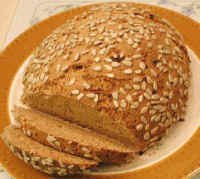 Add the yeast, and blend together with a spoon until the dough becomes elastic and sticky. 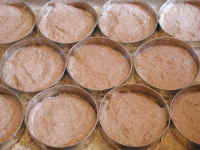 Then beat the dough with a spoon for a few minutes to help aerate the dough. Spoon the dough into the muffin rings to a depth of slightly under 1/2 the height of the rings on the baking pan, and smooth the dough out to the edges. 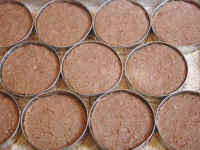 (Raising the crumpet dough) Place the baking pan in the warming drawer of your oven (on low), or in another warm location, and allow the dough to rise to at least twice its original depth. (Baking the crumpets) Place the baking pan in a 350 degree F. preheated oven, and bake for about 30 minutes. 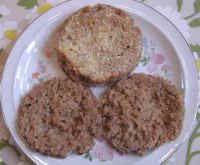 When the crumpets are baked, the surface will be slightly browned and springy to the touch, and the crumpet will have pulled slightly away from the sides of the muffin rings. 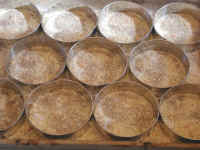 (Removing the muffin rings) When the crumpets are baked, remove the baking pan from the oven and allow to cool on a wire rack. When cooled so you can touch the surface without getting burned, gently twist the muffin rings to remove them from the crumpets. Then gently slide a sharp spatula or knife under the crumpets to remove them from the baking pan. 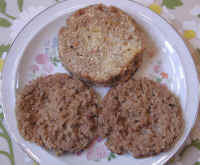 (Toasting a crumpet) To serve, split a crumpet into halves with a sharp knife, and toast. 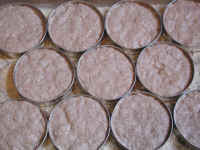 Left-over crumpets can be stored in the freezer in a tightly sealed bag or container with plastic wrap to separate each crumpet. Then when ever you want one, all you have to do is remove it from the freezer bag and warm it up in the microwave oven in less than a minute.